Letter from Henry Allen Moe, Guggenheim Memorial Foundation, to LP RE: Included is a list of three names for LP to review for the Foundation to see if they are fellowship worthy candidates. [Reply from LP to Moe December 2, 1953]. [Filed under LP Science: Box 14.015, Folder 15.1]. Letter from M. Evenari, The Hebrew University, Jerusalem, to LP RE: writes that he is pleased that he will be stopping in Jerusalem on the way to India and hopes that LP will have an opportunity to give a lecture. 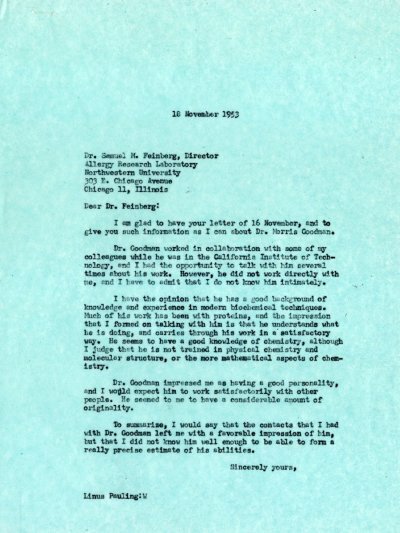 Memo from Robert B Corey to LP RE: sends LP a copy of a memo from Drs. Pasternak and Schroeder to Dr. Corey suggesting that he and LP get in touch with du Vigneaud about obtaining crystals of his peptide intermediates. [mentioned memo from Drs. Paternak and Schroeder to Prof. Corey included] [related letter from LP to Prof. Vincent du Vigneaud December 18, 1953 [Filed under LP Correspondence: Box #425, Folder #5: File (du Vigneaud, Vincent)].